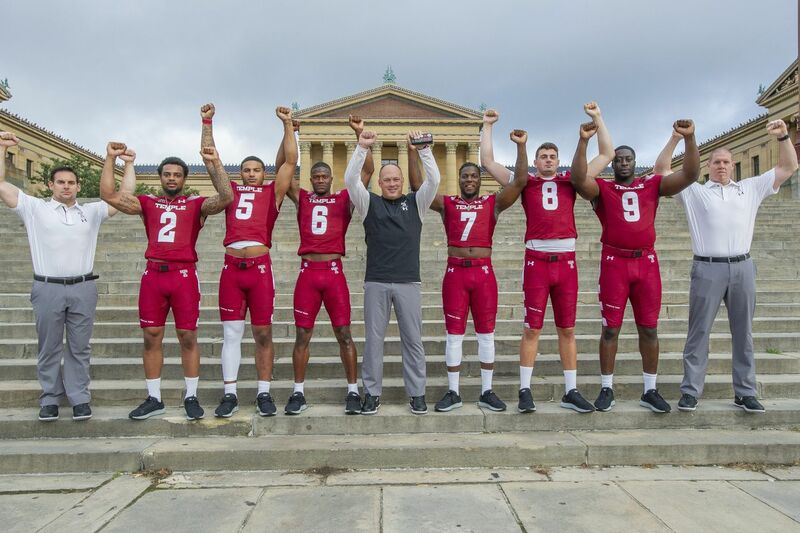 The Temple football season officially kicked off with a team picture that was taken 7:30 a.m., Thursday, on the steps of the Art Museum. In the afternoon, the Owls conducted media day at their practice facility on campus, and they will hold their first practice on Friday. Looking to improve on a 7-6 record that included winning four of the final five games, the Owls have optimism as they prepare for their Sept. 1 noon opener at Lincoln Financial Field against Villanova. Here were some of the highlights of media day, as Geoff Collins begins his second season as Temple's head coach. Junior receiver Isaiah Wright is Temple's most versatile player. He is used mainly at receiver but can also play running back and Wildcat quarterback. Last season, he caught 46 passes for 668 yards and four touchdowns. He also rushed for 188 yards and a TD on 25 carries and returned a kickoff 98 yards for a score. Temple offensive coordinator Dave Patenaude said of Wright: "A good friend of mine, the defensive coordinator at Army, said, 'You are nuts if you don't give that kid the ball 14-15 times a game, he is that explosive.' "
So Patenaude continues to think of ways to get Wright the ball in open space. "When he gets his hands on the ball, he is a playmaker, and it is very difficult to tackle him in the open field, so you have to find enough ways to get him one-on-one with a linebacker or swing him the ball out of the backfield and almost make it like a little punt return to get him out in space — throw it to him, and let him do his thing." Collins announced that Kareen Ali, a former four-star recruit from Timber Creek, won't be playing for Temple. "It is an accumulation of injuries, and it is probably best he doesn't play anymore," Collins said. "That is a doctor's decision and family decision, and I can't stress enough how much we love him and and how much we think about that family and the respect we have for them." Ali appeared in five games for Temple, and Collins suggested that Ali would still help the Owls in their athletic department. Unlike last year, there will be no quarterback battle entering camp. Frank Nutile is the starter after going 4-2 once he replaced Logan Marchi, who has transferred. Nutile was asked whether he was nervous as he enters camp as the undisputed No. 1. "I wouldn't say any nerves; if anything, I just want it to start," he said. "The summer felt really long, I think everyone in the facility feels the same way, that we can't get out there and start practicing" soon enough. Senior cornerback Rock Ya-Sin joined Temple in January, after transferring from Presbyterian College, where he played for three years. He left Presbyterian when it announced it was changing from a Football Championship Subdivision program to a non-scholarship team. He already earned a single-digit uniform number, 6, which Temple awards for toughness and dedication. "It is really an honor that my teammates and coaches nominated me for this," said Ya-Sin, who recorded a school-record five interceptions last season. "There are guys who worked two to three years to get a single [digit], and me coming in January and doing that is just an honor.